The Monkees, plans to scuttle them before they get started. �Your Auntie Grizelda� Written by Jack Keller & Diane Hilderbrand; Produced by Jack Keller & Jeff Barry. At KXIU-TV studios, The Monkees appear to do a gig on a children's TV show called The Captain Crocodile Show. 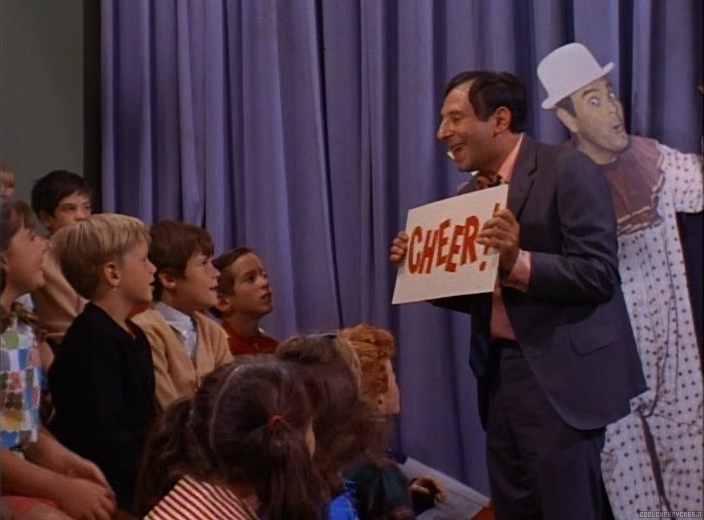 With a minute to go till airtime, kids file into the studio past The Monkees, and sidekick Howard Needleman greets the band, whom he introduces to the star of the show, Captain Crocodile. However, Crocodile, a nasty, conceited, diabolical, underhanded, envious man in gross contrast to his TV persona, sets out to sabotage their appearance and has them stand on a mark on his set dressed in dark green ponchos with feathery light green caps on their heads, where they each end up getting a pie in their face every time the kids yell "Fun!" Later that day, The Monkees arrive at the office to see the TV network executive Junior Pinter and are surprised to find him to be only a 12-year old boy! 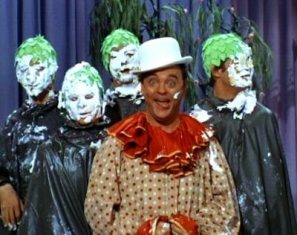 When Junior decides to have them appear on The Captain Crocodile Show on a regular basis, they nearly depart, since they refuse to perform on a show in which they're constantly pelted with pies in the face. Then Junior calls up the president of the network, his father (who gave him the show for his birthday!) vacationing in Sydney, Australia and then guarantees Micky, David, Michael and Peter that they won't be pied in the face anymore and they will be given the chance to perform if they appear on the show again...just before he invites the guys to play hide and seek! Meanwhile, Captain Croc worries to Howard after receiving a memo from Junior Pinter, that he's being eased out and The Monkees will replace him. To avoid this, he comes up with a scheme to make sure that The Monkees' second appearance on his show's a compleet disaster. During the run through, he starts out by nearly wearing down Micky by frantically working him on the cameras, explaining his life story. On the show, Captain Crocodile announces The Monkees will sing for them; the camera pulls to the boys on the bandstand, but just as they begin to perform, the camera immediately pans back to the good Captain who suggests to his home audience that they take a look at his birthday house. The next three times, The Monkees are prevented from singing at every turn by the cameraman, fish nets and even an explosive-laced bass drum. When Michael threatens to quit if he doesn't let them play, The Cap finally concedes and gives them the go-ahead to perform; The Monkees then go on to perform the song �Valleri�. However after the song, the guys discover to their chagrin that the show has been off the air for the entire 5 minutes of their performance. On the Captain Crocodile set, The Monkees bemoan their catastrophic attempt to be a big success on TV, with Peter so distressed he bursts into tears. To cheer him up, The Monkees engage in a fantasy sequence spoofing every type of TV show: first, Michael, Micky, Peter and David don the guise of anchormen as they lampoon The Huntley-Brinkley Report, where Michael, as meteorologist Tex Nesmith, gives an incorrect weather forecast; then, Michael, David and Peter become panelists and Micky a moderator as they take a crack at What's My Line? in a game show called What's My Scene?, where Michael as a brain surgeon writes his occupation on the blackboard making scraping sounds, which instantly switches to a To Tell The Truth parody (To Tell A Fib); and finally, they satirize Batman (Frogman), with Peter as Frogman and David as Reuben The Tadpole who swing in on ropes interrupting Michael and Micky as the villains planning a caper, and the four soon engage in a Batman/Robin-style fistfight, which climaxes with Peter and David bickering with each other over who should say "Crime doesn't pay!". Meanwhile, Captain Croc comes up with another nasty, evil thought: to arrange for a deluge of mail panning The Monkees! Soon Junior tells the guys of hate mail (written in crayon!) from 27 people calling them every name in the book: arrogant egomaniacs, long-haired weirdoes, and loathsome teenagers, (only a letter from Peter's mother finds favor of the boys, calling them delightful and well-bred). This prompts a director�s meeting called by the president, J.J. Pontoon, to discuss The Monkees� future on The Captain Crocodile Show. Micky, as a rating�s expert from The Nielsen Polling Service, Michael, as an elderly building janitor, and David and Peter as 6 year-olds barge in on the meeting to convince the directors that The Monkees are the most popular performers on TV. Then Pontoon orders them out promising a decision by the afternoon. A fearful Captain Croc then launches his next plan by siccing his fan club, The Crocodile Corps, on The Monkees. Soon there's a mad chase all over the Screen Gems lot from set to set to the tune of �Your Auntie Grizelda� which ends on the Captain Crocodile set, where The Corps have The Monkees cornered. They offer to read a story to the children, and, by using a dictionary as a book, improvise events from different fairy tales (only Peter reads actual definitions from the dictionary!) wining the children over. When The Captain angrily berates them for ruining his master plan, his own fans turn on him, and the show is changed to Monkee Menagerie. As they prepare to go on, Howard appears, and, dousing the boys with seltzer, he takes over as host. �Captain Crocodile� is the product of the combined talents of the writing teams of Gerald Gardner & Dee Caruso and Peter Meyerson & Robert Schlitt, thus boasting the largest number of writers ever to collaborate on a Monkees script: 4! Another Monkees episode to be written by 4 writers is No. 38, "I Was A 99-lb. Weakling". Gardner & Caruso and Meyerson previously joined forces in composing the teleplay and story, respectively, of Episode No. 21, �The Prince And The Paupers�. Collector's Note: 2 different remixes from the original multitrack tape of the first �Valleri� have been released by Rhino: on their 2001 Monkees Music Box (R2 76706) and their 2006 2-CD Deluxe Edition reissue of More Of The Monkees (R2 77744). Keller and Hilderbrand's �Your Auntie Grizelda� appears here in its mono mix heard on the mono version of More Of The Monkees. �Captain Crocodile�'s original synopsis shows Junior warning Crocodile he's through should he try anything with The Monkees again, which convinces him that they are his archenemies! Other purged scenes depicted in the storyline feature The Monkees, instead of imagining, rehearsing every type of TV show from quiz to crime, and, after the chase sequence, originally engaging The Crocodile Corps in playing leap frog. Also, in the synopsis, Michael is disguised as an elderly cleaning woman. A different arrangement of the harpsichord redition of the Monkees theme is heard in �Captain Crocodile�'s submain titles. Similar arrangements can be heard in Episode No. 4, �Your Friendly Neighborhood Kidnappers�, No. 6, �The Success Story�, and No. 34, "The Picture Frame" (a.k.a. "The Bank Robbery"). Paul Mazursky was considered to portray Capt. Crocodile's goofball producer. A snippet from �Captain Crocodile� featuring Michael in disguise as the building janitor is used in The Monkees' second season opening credit sequence. �Captain Crocodile� initially aired on NBC on the eve of producer Robert Rafelson's 34th birthday. Another Monkee reference to The Huntley-Brinkley Report (NBC, 1956-70) would be made in a skit featuring David Jones, Micky Dolenz, and Michael Nesmith during their appearance on Episode #44 of Rowan & Martin's Laugh-In (first aired on NBC October 6, 1969). Captain Crocodile is a lampoon of Captain Kangaroo (CBS, 1955-84); The Captain Crocodile Show is a combination of both Captain Kangaroo and The Howdy Doody Show (NBC, 1947-60). The Captain's brief exclamation of "Wonderful, wonderful, wonderful!" is in reference to Lawrence Welk. A second reference to Welk will be made in Episode No. 46, "The Monkees On The Wheel". The Captain Crocodile Show is aired on KXIU, the same station which aired The Amateur Hour in Episode No. 15, �Too Many Girls.� It even uses the same flashing "STAND BY/ON THE AIR" sign as did The Amateur Hour; the sign can also be seen in Episode No. 36, "Monkee Mayor", by WXIU-TV (where Michael delivered his speech to the public). At the beginning of the fantasy sequence wherein The Monkees parodize well-known TV shows, they can be seen in a skit lampooning The Huntley-Brinkley Report, the 15-minute NBC News program which preceded The Monkees for the duration of its run. In the scene where they are pied by Capt. Crocodile, The Monkees wear the same light green caps previously worn by The Jolly Green Giants in Episode No. 19, �Find The Monkees!� (a.k.a. "The Audition"). Also, in the Batman parody sequence, Peter and David wear their Monkeeman capes and the orange sharkskin suits which they wore in the �Tomorrow�s Gonna Be Another Day� romp seen in Episode No. 2, �Monkee See, Monkee Die�, and the �You Just May Be The One� number which appeared in No. 9, �The Chaperone�. At the end, Peter and David are seen tussling with each other over who should say "Crime doesn't pay! ", little suspecting this would later foreshadow an actual fisticuff between the 2 in November 1967! The Monkees are referred to as "long-haired weirdoes" for the first time on the series in this episode. That title would come and go in various later segments, including the next episode, �Monkees A La Mode�, Episode No. 34, "The Picture Frame" (a.k.a. "The Bank Robbery"), No. 41, "The Card-Carrying Red Shoes", and No. 48, "Fairy Tale". In the scene where David comments on Junior Pinter's height ("Y'know, I think 'e's quite tall, meself! "), Micky retorts, "You would!" This 2-word jab would be repeated twice (by Peter!) in Season-2 Episodes No. 35, "Everywhere A Sheik Sheik", and No. 56, "Some Like It Lukewarm" (a.k.a. "The Band Contest"). In the scene where The Monkees grab up a dictionary and adlib a story to The Crocodile Corps, they make a mixture of several fairy tales, including Snow White And The Seven Dwarfs, which David was seen reading in Episode No. 1, �The Royal Flush�. Check out Michael Nesmith's blue jean outfit, seen in the �Valerie�musical number seen here (aside from additional scenes) and in Episode No. 31, �The Monkees At The Movies�. This was his own personal attire, which he previously wore in No. 10, �Here Come The Monkees� (Original Pilot Film), and the interview tag sequences seen in No. 4, �Your Friendly Neighborhood Kidnappers�, No. 6, �The Success Story�, and No. 7, �The Monkees In A Ghost Town�. Director Jim Frawley later directed Larry Gelman in the 1971 National General Picture The Christian Licorice Store, Frawley's big-screen directorial debut. In the scene where David and Peter barge in, dressed like kids, on the meeting to discuss wether The Monkees should be on Captain Crocodile's show, David wears a hat with a hand. Said hat came from the 1953 Columbia Picture, The 5,000 Fingers of Dr. T., which co-starred future Monkee guest Hans Conreid ("The Monkee's Paw"). Michael's interpretive portrayal of weathercaster Tex Nesmith is a spoof of Herbert Jon "Tex" Antoine, Jr. (April 21, 1923 � January 12, 1983), meteorologist on New York City TV airwaves from 1949 to 1977 (he forecasted the weather on WNBC-TV, WABC-TV, and WNEW-TV [now WNYW-TV]). Writer Gerald Gardner's son Lindsay was cast as an extra in "Captain Crocodile"; he can be seen as a member of The Crocodile Corps in a tan sweater. Joey Baio (Junior), cousin of Scott Baio of Happy Days (ABC, 1974-84, a show which Micky Dolenz tried in vain to audition for the much-touted role of The Fonz! ), first acted alongside David Jones during 1964 in a Tony award-nominated Broadway production of Oliver. Philip "Phil" Roth (Howard) is remembered for his role of a Doctor in Catch-22 (Paramount, 1970), Mr. Jones in What's Up, Doc? (Warner Bros., 1972), a Vegas Gambler in Harry And Tonto (20th Century-Fox, 1974, which was co-written, produced and directed by and featured Monkees TV crew alumnus Paul Mazursky), and Woolsey in One Flew Over The Cuckoo's Nest (United Artists, 1975). Sadly, Roth lost his battle to colon cancer on July 15, 2002 at age 74; his last appearance was in the independent film A League Of Old Men (1998).